Why CNOOC’s move matters beyond Canada? China’s CNOOC has made yet another Canadian acquisition; only its latest one announced earlier this week has global implications in the shape of Nexen. On July 23rd Nexen’s board approved CNOOC’s offer to pay US$27.50 per share valuing their company at US$15.1 billion; a near 60% appreciation on valuation at the close of trading on July 20th. So why does this acquisition matter? After all, it isn’t the first time the Chinese state-owned firm has acquired a Canadian asset. Only last November, CNOOC bought Canadian oil sands firm Opti Canada for C$2.1 billion. In 2005, it acquired a 16.7% share of MEG Energy, another Canadian oil firm. A CNOOC communiqué suggests it is operating as any oil company would, i.e. by strategically expanding its reserve base. It says the acquisition, which is yet to be cleared by the Canadian government, would boost its oil reserves by 30%. In a rather 'crude' world, if this Chinese takeover is approved by the Canadians, CNOOC would take control of the UK's largest producing oil field - Buzzard. This would be on top of the Golden Eagle prospection zone about 43 miles offshore from Aberdeen. Unlike oil sands upstarts, Nexen is a major established global operator and has a significant presence in the North Sea. Now if you count Sinopec 49% stake in Talisman's business in the British sector of the North Sea together with hypothetical CNOOC access via a takeover of Nexen; it would in theory give the Chinese control of just under 10% of British oil and gas production in the North Sea! Understandably, there have been murmurings in the Oilholic’s part of the world. However, there are no loud noises as they would run contrary to the British government’s pro-investment stance and in any case they can’t do much about it. By law, the Canadians can block any foreign investments in the country’s firms exceeding C$330 million if the government believes they are not in Canada's best interests. In 2010, the Canadian government prevented BHP Billiton's US$39 billion hostile takeover of fertiliser firm Potash Corp. The LSE-TSX shenanigans of last year are also well documented. Chinese firms have not felt as welcome in the US, but in Canada their investment is not considered a taboo subject. So how the Harper government responds in this case, which has far reaching implications beyond Canada, remains to be seen. Meanwhile, contrary to AAR and tycoon Mikhail Fridman’s assertion that there were no takers for BP’s stake in Russia’s TNK-BP, Russian state giant Rosneft has said it is considering buying the stake. A Roseneft statement earlier this week suggested it was interested in a ‘potential acquisition’. TNK-BP is jointly owned by AAR and BP. Already troubled relations between the two became further fraught after BP sought to form a separate partnership with Rosneft last year. As AAR has preferred bidder status, this gives it around 90 days during which BP can talk to – but not sign an agreement with – other parties interested in its stake. BP put up its half of the TNK-BP business up for sale in June. AAR has itself declared an interest in buying BP's share. Finally, the Oilholic is getting in to the Olympics spirit as well! The Chinese, Russians, Americans, Canadians and athletes of some 200-odd countries are now in London town. 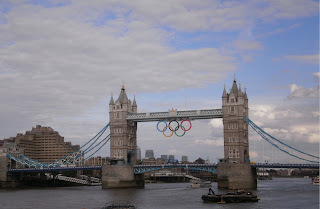 The Tower Bridge has got its own fancy Olympics rings (see above) and the Olympic Torch passed from the street in front of this blogger’s humble abode on Thursday (see below)! For those wondering how the torch was being kept powered-up in some really wretched British weather – there is a liquid fuel canister located about halfway up the torch connected via tiny pipe to the top. Through it, the fuel travels up before it is released out at the top of the torch where the pressure in it decreases and this converts the liquid into gas ignited by a spark. Despite exhaustive enquiries, no one would reveal the flow rate which is special to each Olympic torch. This has been the case since 1972 and London 2012 is no exception to this rule. Quite a few London 2012 Olympic Torches are up for sale on eBay should any of you wish to get your own now that Olympics opening ceremony is done and the cauldron has been lit in the stadium. That’s all for the moment folks! Keep reading, keep it 'crude'! © Gaurav Sharma 2012. Photo 1: North Sea oil rig © Shell. Photo 2: Tower Bridge London with Olympic rings. 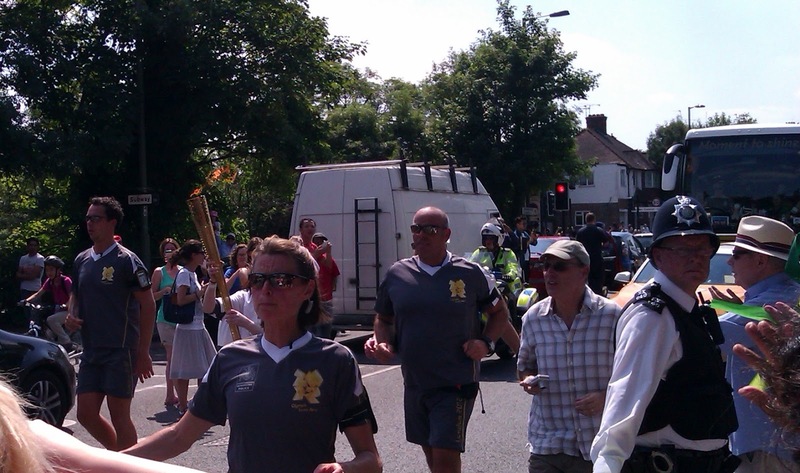 Photo 3: London 2012 Olympic Torch passes through London Borough of Barnet, UK. © Gaurav Sharma 2012. Concerns over a conflict in the Middle East involving Iran did ease off last week but apparently not far enough to prevent a further slide in the price of the crude stuff. A relative strengthening of the US dollar was also seen supporting prices to the upside despite Eurozone woes. So Brent resisted a slide below US$107 on Friday while the WTI resisted a slide below US$91 a barrel. In fact, the WTI August contract reached a high of US$92.94 while Brent touched US$108.18 at one point; the highest for both benchmarks since May 22. This meant that the end of last week saw some good old fashioned profit taking with conditions being perfect for it. However, on this crude Monday afternoon, we see both benchmarks dipping again. When the Oilholic last checked, Brent was resisting a slide below US$102 per barrel while the WTI was resisting a US$88 level. With the Middle East risk premium easing marginally, City traders have turned their attention to Spain. Last week the country’s government predicted that the Spanish recession may well extend into next year. Additionally, the regional administration of Valencia asked for federal help from Madrid to balance its books. So what have we learnt over the last seven or eight trading sessions and what has changed? Well not much except that oil price forecasting often resembles an inexact task based on fickle market conjecture. The bullish sentiments of last week were an aberration prompted by the perceived risk of a conflict in the Middle East which the Iranians would be incredibly barmy to trigger. Add the temporary lowering of oil production courtesy a Norwegian strike and you provide the legs to a perfect short term prancing bull! Existing economic fundamentals and current supply demand scenarios did not merit last week’s pricing levels either side of the pond. The Oilholic agrees with the EIA’s opinion that the Brent price would indeed range between US$97.50 and US$99.50 a barrel up until the end of 2013. Analysts at investment banks and ratings agencies are also responding. For instance, Société Générale has downgraded Brent price estimates by 10% over 2012-14, from US$117 a barrel to US$105. The French bank views oil market fundamentals as neutral for the rest of the year. Nonetheless, should the Brent price weaken below US$90, like others in the City, Société Générale says a Saudi response is to be expected. For what it is worth, at least Brent’s premium to the WTI has been constantly taking a knock. By some traders' accounts, it is presently below US$15 a barrel for the September settlement contract having been at US$26.75 at one point over Q4 2011. As a direct consequence of the linkage between waterborne light sweet crudes, the Louisiana Light Sweet’s premium to the WTI is down as well to around US$16 a barrel according to Bloomberg. Moving away from pricing, Lord Browne – the former boss of BP and a director of fracking firm Cuadrilla – believes shale prospection would rid the US of oil imports. Speaking in Oxford at the Resource 2012 forum on water, food and energy scarcity, Browne said the US will not need to import any crude within two decades. He quipped that the amount of shale gas in the US was effectively “infinite". On a sombre note, Browne said, “Shale gas has a very bad reputation, as a result of the weak players cutting corners. Regulation tightening would be welcome." His Lordship is known to be a member of the “All hail shale” brigade. Back in March he told The Independent newspaper that if fracking took off meaning fully in the UK, it could generate 50,000 British jobs. The country could very well need its own shale drive especially as a government watchdog recently warned of declining oil and gas revenues. A consultation period is currently underway in London. All UK fracking activity ground to a halt last year, when a couple of minor quakes majorly spooked dwellers of Lancashire where Cuadrilla was test fracking. Given the incident and environmental constrictions, the Oilholic suspects that Lord Browne knows it is too early to get excited about shale from a British perspective. However, Americans see no cause for curbing their enthusiasm. That’s all for the moment folks. Keep reading, keep it ‘crude’! © Gaurav Sharma 2012. Photo: Oil tankers in English Bay, British Columbia, Canada © Gaurav Sharma 2012. Brent & the ‘crude’ fortnight to Friday the 13th! Despite crude economic headwinds, the Brent forward month futures price spiked back well above US$100 per barrel on July 3. No one was convinced it’d stay there and so it proved to be barely a week later. Since then it has lurked around the US$100 mark. Our crude friends in the trading community always like to flag up supply shocks – some real some and some perceived along with some profit taking thrown in the mix. The Norwegian oil industry strike which began on June 24 was a very real threat to supply. When oil industry workers down tools in a country which is the world’s fifth largest exporter of the crude stuff, then alarm bells ought to ring and so they did. Being a waterborne crude benchmark, Brent was always likely to be susceptible to one of its main production sources. The Louisiana Light’s fluctuation over the hurricane season stateside would be a fair analogy for the way Brent responded to the news of the strike. Quite frankly, forget the benchmark; the strike saw Norwegian oil production dip by 13% and its gas output by 4% over the 16 days that it lasted. So when a Reuters report came in that Norway's government had used emergency powers to step in and force offshore oil and gas workers back to work, more than the bulls eased off. The dispute, which is by no means over, concerns offshore workers' demand for the right to retire early, at 62, with a full pension. The row revolves around the elimination of a pension add-on introduced in 1998 for workers who retire (at 62), five years ahead of Norway's official retirement age and three years ahead of the general age for oil workers. Accompanying a very real supply shock in the shape of the Norwegian strike were empty threats from Iran to close the Strait of Hormuz in wake of the EU sanctions squeeze. Traders put two and two together and perhaps came-up with 22 out of a sense of mischief. First of all, the Iranians would be mighty silly if they decided to close the Strait of Hormuz with the US Fifth fleet lurking around. It just would not work and Iran would hurt itself more for the sake of what would at best be a temporary disruption. Secondly, City estimates, for instance the latest one being put out by Capital Economics, suggest that the US and EU sanctions could ultimately reduce oil exports from Iran by as much as 1.5 million barrels per day (bpd). While it is serious stuff for Iran, the figure is less than 2% of global supply. As such hardly anyone in the City expects the implementation of sanctions on Iran to be a game-changer from a pricing standpoint. “We maintain our view that the imminent tightening of Western sanctions on Iran is unlikely to have anywhere near as large an impact on global oil prices as many had feared. Demand is weakening and other suppliers are both able and willing to meet any shortfall. Admittedly, much could still depend on how the Iranian regime chooses to respond,” said Julian Jessop of Capital Economics. Causative effect of such a market sentiment predictably sees Brent back in US$90s to lower US$100 range. In fact Capital Economics, Société Générale, Moody’s and many other forecasters have a US$70-100 per barrel forecast for Brent for the remainder of the year. A spokesperson for Moody’s told the Oilholic that the agency has lowered its crude price assumptions to US$100/barrel for Brent and US$90/barrel for WTI in 2012, with an additional expected decline to US$95/barrel for Brent and US$85/barrel for WTI in 2013. Moody's also expects that the spread between benchmark Brent and WTI crude will narrow to about US$5 in 2014. In a report, the agency adds that a drop in oil prices and jitters over economic conditions in Europe, the US and China suggest the global exploration and production sector (E&P) will see its earnings grow more slowly over the next 12 to 18 months. As such, Moody's expects E&P industry EBITDA to grow in the mid-to-high single digits year on year through mid-2013. Expectations for EBITDA growth in the sector above 10% would suggest a positive outlook, while a retreat of 10% or more would point to a negative outlook. 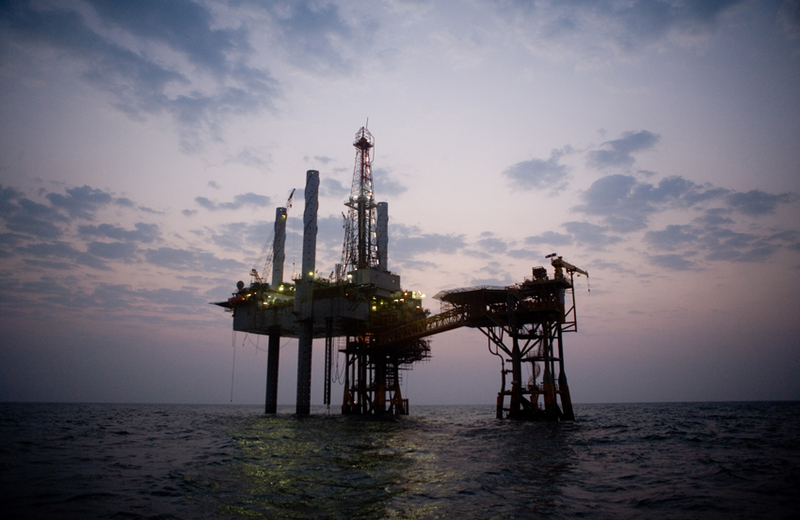 Moody's changed its outlook for the E&P industry to stable from positive on June 27, 2012. The agency also expects little change in US natural gas prices before the end of 2013 with a normal winter offering the best near-term support for natural gas prices as increased utility and industrial demand will ramp up slowly. On the corporate front, in an interesting fortnight Origin Energy announced that the Australia Pacific LNG project (APLNG) – in which its stake is at 37.5% after completion of Sinopec's additional equity subscription – has received board approval for Final Investment Decision (FID) for the development of a second LNG train. The expanded two-train project is expected to cost US$20 billion for a coal seam gas (CSG) to liquefied natural gas (LNG) project in Queensland, Australia. Elsewhere, India’s Essar Energy subsidiary Essar E&P Ltd is to sell a 50% stake in Vietnam's offshore gas exploration block 114 to Italy’s ENI. Under the terms of the transaction, which is still subject to approval from the Vietnamese government, ENI is also assuming operator status for the block. Yours truly guesses the Indian company finally decided it was time to indulge in a bit of risk diversification. Continuing with corporate stuff, the Oilholic told you BP’s planned divestment in TNK-BP won’t come about that easily or smoothly. One of its oligarch partners - Mikhail Fridman - has alleged that there are no credible buyers for BP’s 50% stake in the dispute ridden Russian venture. In an interview with the Wall Street Journal on June 29, Fridman said, "We doubt it has any basis in fact. They are trying to buy time, to reassure investors." However, BP said it stood by its announcement. It also announced an agreement to sell its interests in the Alba and Britannia fields in the British sector of the North Sea to Mitsui for US$280 million. The sale includes BP’s non-operating 13.3% stake in Alba and 8.97% stake in Britannia. Completion of the deal is anticipated by the end of Q3 2012, subject to UK regulatory approvals. Net production from the two fields averages around 7,000 barrels of oil equivalent per day. It is yet another example of BP’s smart management of its asset portfolio in wake of Macondo as the company refocuses on pastures and businesses new. Elsewhere in the North Sea, Dana Petroleum expects to start drilling at two new oil fields off Shetland named - Harris and Barra – by Q2 2013. The first crude consignment from what’s described as the Western Isles project will come onstream in 2015. A spokesperson said field production could run for 15 years. The region needs all the barrels it can pull as the UK’s budgetary watchdog – the Office for Budget Responsibility (OBR) – has projected that future oil and gas revenues from the North Sea may be much lower than previous forecasts. OBR sees the Brent prices rise from US$95/barrel in 2016 to US$173/barrel in 2040. “This compares lower with a projection in our assessment last year of a rise from US$107/barrel in 2015, rising to US$206/barrel in 2040," a spokesperson said. As a result the OBR now projects tax receipts will be about 0.05% of GDP by 2040-41; half the level it projected in last year. It identified lower projected oil and gas prices as the key driver for the reduced figures given this year. The Oilholic won’t be called upon to vote on Scottish independence; but if yours truly was a Scottish Nationalist then there’d be a lot to worry about. Finally, it looks like UK regulator – the Takeover Panel – has had enough of the protracted battle for the takeover of Cove Energy between Royal Dutch Shell and Thailand's PTTEP. It has given both parties a deadline of July 16 to make their final offers. The Takeover Panel announced on Friday 13, July 2012 that if no offer is accepted by the said date, the sale of Cove will be decided by an auction on July 17. It could be lucky for neither, if they pay over the odds. That’s all for the moment folks. Keep reading, keep it ‘crude’! © Gaurav Sharma 2012. 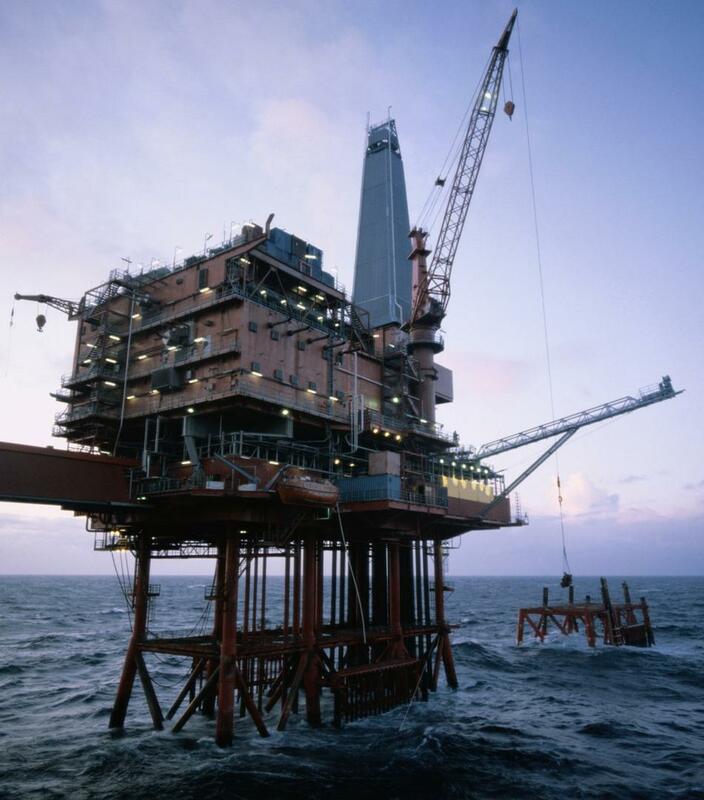 Photo: North Sea oil rig © Cairn Energy. If the oil companies had answers to the energy crisis, and in some cases maybe they do, would you believe them? Given that most of us grow up loathing big oil for a multitude of reasons ranging from environmental to monetary ones while filling up the gas tank, all thoughts put forward by energy companies become suspect. 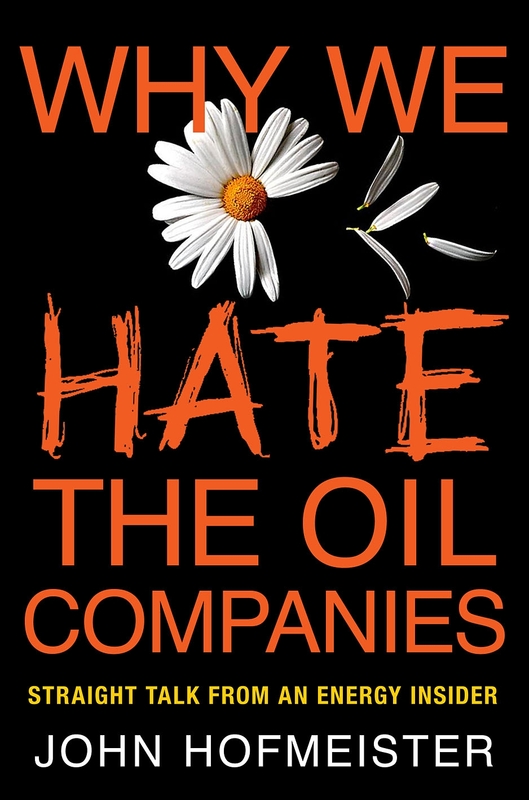 Or as the author of the book – Why we hate the oil companies? Straight talk from an energy insider – asks, would you accept the fox’s plan for the hen coop? Written by none other than John Hofmeister, the former president of Shell, it examines what’s behind the energy companies' swagger or perceived swagger. Having made the transition from being a mere consumer of gasoline to the president of a major oil company, Hofmeister attempts to feel the pulse of public sentiment which ranges from indifference to pure hatred of those who produce the crude stuff. Spread over 270 pages split by 14 chapters, this book does its best to offer a reasonably convincing insider’s account of the industry. Along the way it dwells on how politicians and special interest groups use energy misinformation and disinformation to meet their own odds and ends in a high stakes game. Hofmeister founded the US Citizens for Affordable Energy; an American grassroots campaign aimed changing the way the US looks at energy and energy security. So this book benefits from his thoughts on solving energy issues, offering targeted solutions on affordable and clean energy, environmental protection and sustained economic competitiveness. The tone is a surprisingly frank one and research is solid. It is also no corporate waffle from an oilman lest sceptics dismiss it as such without reading it. The Oilholic believes it even throws up some pragmatic solutions which appear sound at least on paper. So while there is little not to like about the book, there is one glaring caveat. It is just way too American in its scope. Yours truly is happy to recommend this book to our friends across the pond in North America; but readers elsewhere while appreciating the narrative, may come to the same conclusion.